23 Olympic National Governing Bodies of Sport are headquartered here. 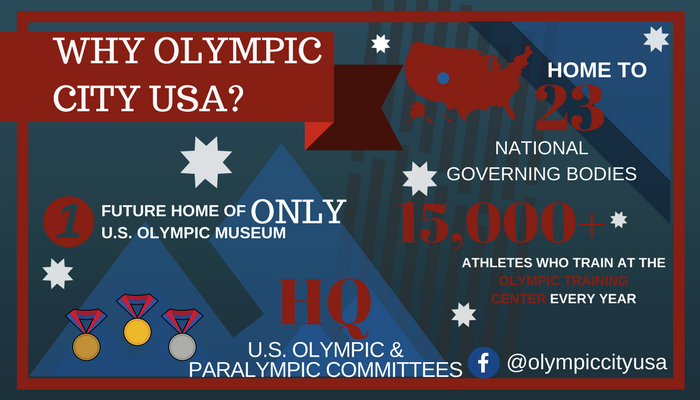 130,000 people come to tour the U.S. Olympic Training Center in Colorado Springs each year. In 2019, the nation’s only U.S. Olympic Museum & Hall of Fame will open near downtown. The Museum is expected to draw over 350,000 visitors per year. Over 10,000 athletes train at the flagship U.S. Olympic Training Center in Colorado Springs each year. Colorado Springs boasts 9,000 acres of parkland, used regularly by training athletes. Colorado Springs is the second-largest city in Colorado population-wise, and the largest geographically. Nine currently-serving Colorado Springs Police Officers trained at the U.S. Olympic Training Center in a variety of sports. Tactical Enforcement Officer Adam Wheeler won a bronze medal in Greco-Roman wrestling at the 2008 Olympics in Beijing. Officer Clifton Sunada was a 1996 Olympian and won a silver medal in Judo at the 1991 PanAmerican Games. His brother, Officer Clayton Sunada, also trained in Judo. Officers Chris Burns & Deidra Worley are School Resource Officers for CSPD – both trained at the U.S. OTC in Judo before working with local youth in Colorado Springs. Three members of the CSPD – an officer, a sergeant and a lieutenant, trained in International Shooting at the USOTC before joining the police force. CSPD Officer Steve Pugsley has twice escorted the Olympic torch He has also done this with the PanAm Games and is waiting to see if he is selected this year to be part of the security team for the Rio Torch Relay.